LOS ANGELES — With NASA facing tight budget constraints, the space agency must strike a balance between devoting funds to keep existing missions and spacecraft operating, while also investing in new technology and innovation for future exploration, an agency official said this week. "Our spacecraft are lasting longer, our spacecraft are doing very noble science, but they're very expensive to operate, so you can't have the money both to operate systems for much longer than their expected operating life, and have the money to invent the next generation of spacecraft and scientific instruments as you go forward," said Eugene Tattini, deputy director of NASA's Jet Propulsion Laboratory (JPL) in Pasadena, Calif. "So that's kind of the good news, bad news thing." Tattini's remarks came during his keynote speech at the Los Angeles Convention Center here Tuesday (May 8) during the first Spacecraft Technology Expo 2012. Tattini is responsible for managing JPL's various science and exploration programs, and oversees the center's resources and daily activities. As NASA continues to operate in a difficult budgetary climate, JPL has experienced an evolving role within the agency, he said. In his fiscal year 2013 budget proposal, President Obama has requested $17.7 billion for NASA. Of that figure, 35 percent is devoted to science, 60 percent for human exploration, and 5 percent for aeronautics. But funding for technology has not been left out of the equation. "The last two budget submits to the Congress, and as we've gone through the authorization and appropriation cycle, the NASA technology line has increased substantially from what it was under the Constellation program," Tattini said. "Today, if you look at the [fiscal year] '13 appropriations being deliberated within the House and the Senate, we'll have a little over half a billion dollars in technology money." Investing in technology will help NASA's future space exploration goals, which include manned missions to an asteroid and Mars. But the groundwork for these missions has already been laid, in particular with the agency's many robotic expeditions. 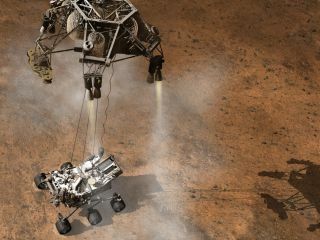 In particular, engineers at JPL are preparing for the Mars Science Laboratory's much-anticipated arrival at Mars in early August. The spacecraft, which will release the Mini Cooper-size Curiosity rover, is scheduled to land on the surface of the Red Planet on Aug. 6.